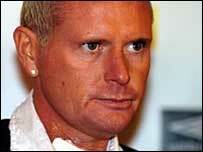 Former England football star Paul Gascoigne has been released on bail after being questioned about an alleged assault outside a hotel. Mr Gascoigne was arrested on Monday night outside the Hope Street Hotel in Liverpool after photographer Steve Farrell said he was attacked. Merseyside Police said a 38-year-old man was questioned about the incident. The ex-Newcastle, Rangers and Spurs player was sacked as non-league Kettering Town's manager on Monday. He had been in Liverpool on Monday to speak at a fundraising event for a drug and alcohol rehabilitation centre. It is not clear if he was staying at the Hope Street Hotel, but paramedics were called and they treated the photographer at the scene. "The person who reported the matter was a member of the press who received medical treatment at the scene," Merseyside Police said. They would not say which organisation the journalist was from, though he was later reported to be a freelance photographer. Speaking to the BBC, musician Chris Difford said he was at the event and saw some "pushing and shoving" outside involving some photographers. Mr Gascoigne did not appear to want his picture taken, he said. "He did not appear to be under the influence of alcohol," added Mr Difford. Earlier on Monday, Kettering Town chairman Imraan Ladak fired Mr Gascoigne after just 39 days in charge at the Nationwide Conference North side, over claims about his conduct. Mr Ladak said he spoke to Mr Gascoigne after 37 separate incidents since he became manager. He claimed Mr Gascoigne was "under the influence of alcohol before, during and after several first-team games and training sessions". Mr Ladak had urged Mr Gascoigne to seek "professional medical assistance". The former midfielder, whose other clubs as a player included Lazio, Everton, Middlesbrough and Burnley, admitted drinking a double brandy before one game. Mr Gascoigne posted a statement on his website criticising Mr Ladak over lack of funds for players and accusing him of undermining his position as manager. He admitted he had been through a "tough time" over the past year and was having counselling. "During my time at Kettering Town, I was never drunk before, during or after a match nor at a training session," he said. "I did, however, have a double brandy before the match on the day after my friend George Best passed away and, after the defeat last Saturday, I had a glass of wine with Paul Davis. "On neither occasion did this affect my ability to manage the team. "I was fully committed to Kettering Town FC for the brief period I was in charge and any allegations to the contrary are entirely without foundation. "I also thoroughly enjoyed working with a great bunch of lads and I wish them every success under Kevin Wilson."